heightec offers an unrivalled series of high quality indoor training environments, combining a floor area of over 45,000 square feet and a wide range of specially designed training apparatus replicating realistic work situations. By combining both indoor and outdoor training facilities, we can guarantee the delivery of a course at any time of the year without foul weather interruption. Candidates learning ability is not compromised by being cold and wet. Yet, these external facilities can provide candidates with height exposure and practical work conditions. Examples of just some of our training facilities are shown below. WTG simulators - Our WTG simulators have an internal tower, hub, yaw and roof. The simulators are designed to accommodate wind climber and rescue training for a range of wind turbines including Vestas onshore and offshore, RePower, Celtic, Nordex, Enercon and Siemens, enabling training to take place without incurring the costs of turbine shutdowns. Telecom towers - A range of indoor and outdoor telecom masts and towers with gated intermediate platform are ideal for training in the use of fixed safety equipment and in rescue procedures. Our towers also have a variety of dishes and antenna for rigging and light lifting courses. Suspended steelwork - Is a central training feature for advanced techniques in rope access or rope rescue. Our training centres have a wide selection of structures with varying degrees of exposure. Interior & exterior flat roofs - Roof safety and height safety training courses are increasingly required in the facilities maintenance and telecoms industries. 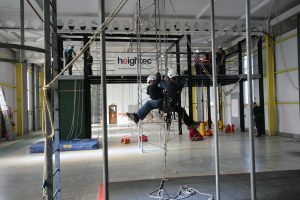 heightec training facilities are designed to deliver competence in a full range of roof safety equipment, including work restraint, positioning and the use of fixed fall arrest systems. Elevated Platforms - It is important when training in rescue procedures that the training location is as realistic as possible. heightec offers several elevated platforms, at heights of between 6 m and 26 m. Platforms are commonly used in courses which require a range of procedures for safety of rescuers and casualty recovery. Platforms are fitted with a safe methods of access or egress. Confined areas - Confined access points are situated in several places, allowing entry to areas underneath. These openings are variously constricted to give experience of a full range of entry methods, for example, a Quadpod and winch. Some apertures require specialist techniques, especially where the rescue of a person using breathing apparatus is concerned. 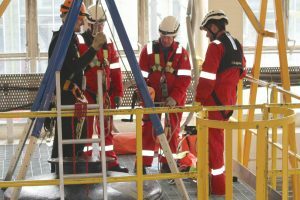 Click confined space training for details of our courses.